The recent dip in the stock price will surely be attracting investors to buy in, and despite the guidance reduction, the stock looks to be a good value. Honeywell International Inc. (NYSE:HON) hasn't had a recent history of disappointing investors, so the recent guidance cuts must have come as something of a surprise. Whenever a company reduces estimates, there's a reduction in confidence and holders looking to exit the stock, but I happen to think it's created a buying opportunity in the stock, and here's why. IMAGE SOURCE: HONEYWELL INTERNATIONAL INC. WEBSITE. The following table outlines how management's full-year outlook for 2016 has changed as the year has progressed. The reductions are significant. Sales guidance (reported and core organic) was cut in the second quarter and then again in the third quarter. In addition, segment margin and free cash flow guidance was cut in the third quarter. At the company's investor conference in May, management's outlook called for core organic growth of 4% to 5% for 2017, but the updated guidance is for "low single digit" growth -- investors should be on look out for any further changes when the company gives its annual outlook in December. A combination of factors in the aerospace segment and ongoing weakness in performance materials and technologies (PMT) was the primary reason the outlook was reduced. But here's the thing. The underlying market conditions in commercial aerospace remain strong -- though defense and the business-jet market is clearly weaker -- and part of the reduction in revenue and earnings guidance is due to actions taken to improve long-term profitability. Moreover, management has good cause to believe conditions in the PMT segment will improve. Aerospace reduction, from "deployment," of $75 million. Aerospace reduction, from "slower macro," of $185 million to $105 million. PMT reduction, from "slower macro," of $110 million to $100 million. Deployment is simply a consequence of granting OEM incentives to gain a position on aircraft platforms -- once a position is established, Honeywell will generate strong recurring revenue in the future. Short-term pain for long-term gain. However, the good news is the incentives will reduce in 2017, creating tailwinds instead of headwinds. HONEYWELL INTERNATIONAL INC. IS SEEING WEAKER CONDITIONS IN THE BUSINESS-JET MARKET. IMAGE SOURCE: GETTY IMAGES. As for the PMT reduction, it's due to a 10% core organic decline in sales in the UOP subsidiary, which specializes in catalysts and absorbents for the processing industry. However, UOP backlog is up 15%, and management forecast high-single-digit sales growth in the fourth quarter. The aerospace "slower macro" is a concern, especially as helicopters and business jets show weakness. Overall, commercial aftermarket sales were up only 1% in the third quarter, but they tend to be highly variable from quarter to quarter. Moreover, Alcoa Inc. (NYSE:AA) and others have indicated that the underlying fundamentals are strong, and the International Air Transport Association is predicting 6% growth in passenger departures for 2016. All told, management expects EPS to grow by double digits in 2017. So the company is still set to grow, but what about valuation? 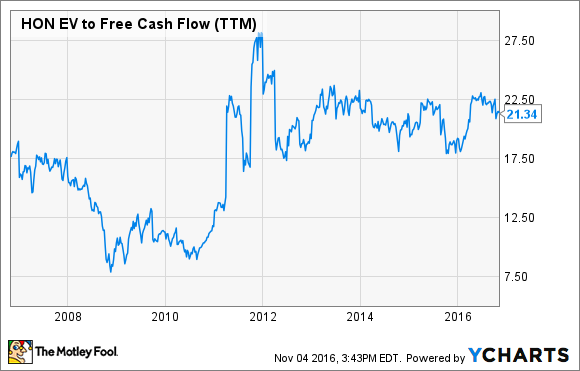 Despite the reduced guidance, Honeywell still looks to be a good value. For example, the midpoint of the reduced free-cash-flow (FCF) guidance is $4.25 billion. Now in recent years, management has made capital expenditures at 1.6 times depreciation to fund future growth. The expectation is that it will normalize to between 1 and 1.2 times depreciation in the future -- you want a company to spend more than depreciation, because it's usually better for a company to grow earnings. If you "normalize" the 2016 capital spending to 1.1 times depreciation, instead of the reported 1.58, it comes to around $766 million. That's around $330 million less than the forecast for $1.1 billion in capital expenditures in 2016. Adding the $330 million to the $4.25 billion free-cash forecast -- to "normalize" FCF -- gives a figure of $4.58 billion. It's an even better value if Honeywell can hit its double-digit earnings target for next year, especially as it goes through a year of transition toward higher growth in the future.